Well, the answer is simple really, a Bug Hotel provides a place of shelter for insects in the cold winter months. We give shelter to the insects; but why do we want insects anyway? Let’s face it, they just creep and buzz around, annoy everyone and eat plants. That also is quite true; but the main reason we need insects is because they pollinate plants and if we didn’t have them then 80% of all the plants we use for food would disappear. In fact, without pollinators the human race would disappear. Earth without humans!… what a thought! Who’d mind the horses?! 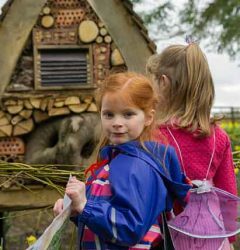 The idea of Bug Hotels, started about 15 years ago when people were beginning to get seriously concerned about the natural environment and how some humans are really doing their best to destroy it! So people began to realise the importance of insects and that it’s essential that we stop using poisonous sprays on our crops and instead encourage a balance of insects to do the work for us. The main pollinating insects are: bees, butterflies, moths, flies, ants and beetles – not forgetting birds of course! 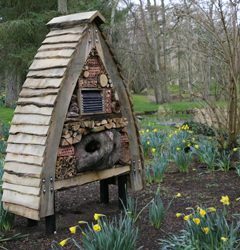 So bearing all of this in mind, we thought a Bug Hotel here at the Irish National Stud, would be a good idea … so that there would still be humans around to look after the horses! 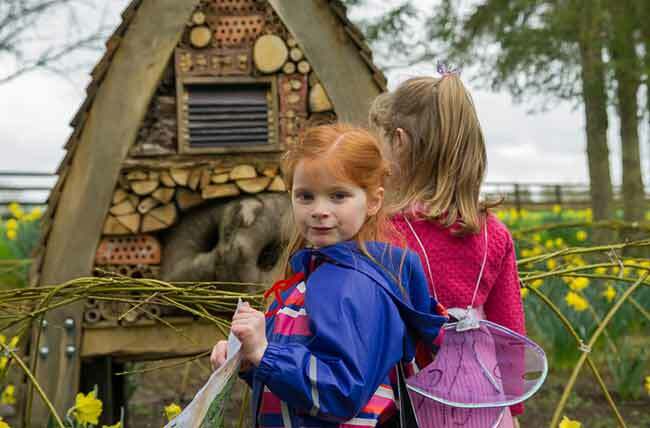 A Bug Hotel is made up of sticks, bamboos, bits of bricks and timber. In fact you can use any old bits of things like pots or branches or cardboard rolled up and lots of other things to make a hotel in your own garden. The simplest way to make it is to get a bit of a drainage pipe or an old flower pot with the bottom missing. You then stuff this with bamboos leaving the cut ends exposed, and I bet in no time your Bug Hotel will be full of the most amazing creatures! The insects will automatically find their way into it. They like dark, squashed places. Just be a bit careful sticking your fingers in – remember some insects nip and sting! If you don’t want to build a Bug Hotel yourself just go and look under a flower pot or brick at home, I bet you’ll find lots of woodlice, beetles and worms! To encourage even more of the pollinators into a Bug Hotel, it’s a good idea to plant wildflowers nearby. We’ll be sowing wildflower seeds around “The Buglington” in the next couple of weeks so hopefully we’ll have lots of butterflies and bees all summer! IMPORTANT. 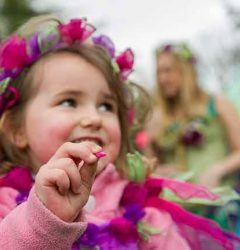 One thing you must remember, if you’re sowing wildflower seeds you must make sure that they come from Ireland and not from another country. Travelling from the M7 take Exit 13 in the direction of Nurney on the R415 as far as Newtown Cross. Turn left and continue to the T-Junction. Turn right at the T-Junction for the Visitors car park, drive a short distance and then turn left. The car park entrance is 200m on the left. Distance from Exit 13 to car park – 1.3 miles.